Long story short: I was staring idly at my stock of 4 ply wool thinking that I should make up a few unusual pieces to bring along to the wonderful WAWS Wool Show. The Tangerine Orange colour-way whispered carrot to me rather than tangerine. 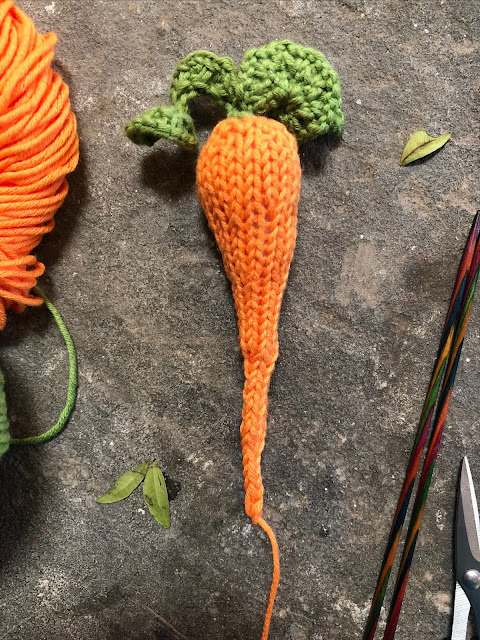 And a fun 40 minutes later a funky carrot was born. 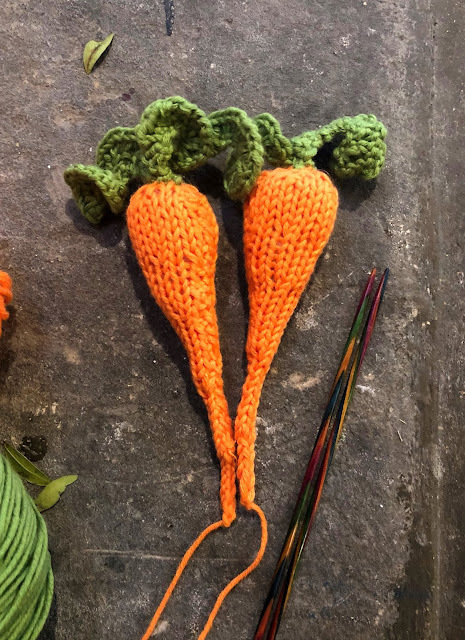 Mr B, who is at heart a very practical sort, wondered vaguely what anyone would do with a knitted carrot; he didn't reckon it would work in a casserole. Emi thought it looked prettier than a flower, which was nice, but still didn't quite answer the question. Using Costa Brava 4 ply pure organic cotton yarn in our Tangerine colourway cast on 6 stitches (sts) on 2.5 mm needles. Row 9: *[K1, K2 tog]*. Repeat from * to * to end of row (you will finish with 12 sts). Row 23: *[K 2 tog]*. Repeat from * to * to end of row (you will finish with 4 sts). Row 31: *[K 2 tog]*. Repeat from * to * to end of row (you will finish with 2 sts). Work the 2 stitches that remain in an i-cord for 4 rows. Row 35: K 2 tog. Cast off leaving the cast off tail as the trailing, wispy root from the bottom of the carrot. Sew up, stuffing with toy filler as you go. Using Costa Brava 4 ply pure organic cotton yarn in our Green Bean colourway cast on 12 stitches (sts) on 2.5 mm needles. Row 1: Knit into the front, the back and then the front again of each stitch. You will finish this row with 36 stitches. Row 2: Cast off purl-wise, and sew in your loose end. Your leaf will miraculously cork-screw with very little encouragement given the crazy number of add-ons you've worked on the first row. Use your cast-on tail to sew the curly leaf to the top of your carrot. Your carrots are really cute. I think the magnet idea is cute. They are darn cute, and I was thinking the exact same thing about a tote...or on a coat. Or someone with red hair could wear them in and be a carrot top for sure...which I happen to love red hair. So not being negative, just trying to be funny.